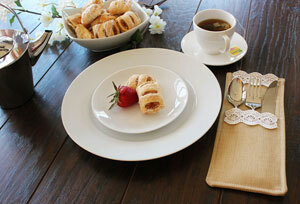 Add style to your dining room table with a pretty flatware pocket. 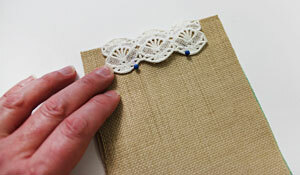 A freestanding lace border brings just the right touch of charm to the elegant project. Your guests will be in awe at the creative addition. Read below for the free project instructions! 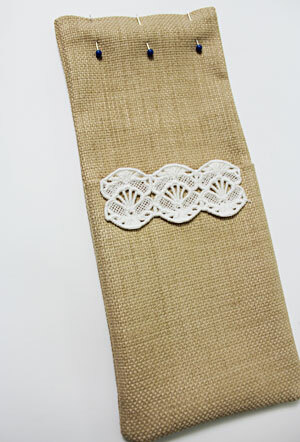 I used the small size of the Seashell Scallop Border (Lace) design. 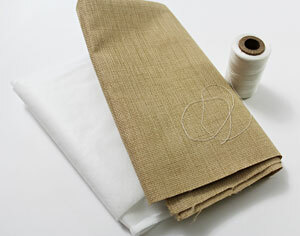 You can use either 40 weight rayon thread or 30 - 35 weight cotton thread. I use Coats and Clark 30 and 35 weight cotton thread. It's labeled as Mercerized ELS Cotton for Machine Quilting & Crafts; Machine Quilting; or All Purpose. I find Coats and Clark cotton thread at JoAnn's. I've also used Madeira Cotona, which is a 30 weight cotton thread. I use the 30 - 35 weight cotton thread both in the bobbin (I wind my own bobbins) and in the top (needle). There are many, many different brands of water-soluble stabilizer available. Some are thin and light, some are fibrous, and some are thick and heavy. It can be confusing to pick the right one for your lace project. 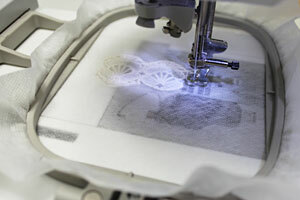 We've digitized and stitched thousands of freestanding lace designs, and have consistently excellent results with Sulky Ultra Solvy (the heavy weight water-soluble stabilizer by Sulky) and Vilene, a fibrous water-soluble stabilizer. We order Vilene from www.pointetopointe.com. Use a sharp needle (as opposed to an embroidery needle) when embroidering onto water-soluble stabilizer -- especially if using the "plastic-looking" kind (such as Sulky Ultra Solvy). An embroidery needle has a larger point, which makes larger holes in the water-soluble stabilizer, leading to tearing and misalignment. 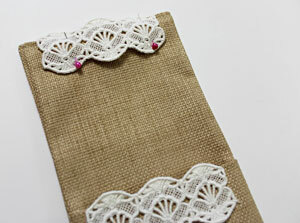 To get started, I will embroider the lace borders. Hoop a piece of water soluble stabilizer (I prefer Vilene or Sulky Ultra Solvy) -- I used Vilene. Since both sides of the lace will be seen, wind a bobbin with the same thread you will be using in the needle. I am using Coats and Clark 30 weight Mercerized ELS Cotton thread. 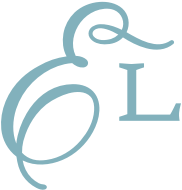 Cotton thread gives the lace a bit softer feel and appearance (compared to rayon thread). 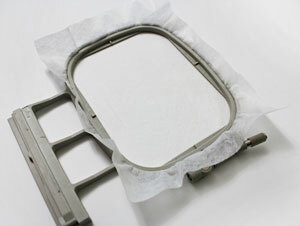 Attach the hoop to the machine and load the design. Embroider the lace. After the lace has finished sewing, un-hoop the stabilizer and trim around the lace being careful to not cut any of the stitches. Soak the lace in warm water for about 10 to 15 minutes. 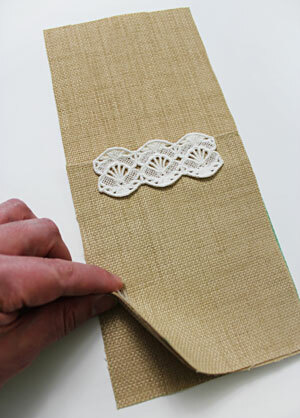 After soaking, blot the lace with paper towels and allow the lace to air dry. After the lace is dry, press it with an iron on a low setting and with a pressing cloth on top of the lace (this prevents scorching). Embroider, soak, dry, and press a total of two of the lace borders. Now that the lace is prepared, it's time to get the fabric ready for the front of the pocket. Cut a piece of sturdy cotton fabric (I used textured canvas/outdoor fabric) to 5" wide by 12" high. Fold the fabric widthwise in half (bring the short ends together), wrong sides together, and press the fold with an iron. Top stitch a 1/8" seam along the top folded edge only. Add one of the lace pieces along the top edge of the fabric with 1/4" of the top edge of the lace extending past the top edge of the fabric. Center the lace side to side by measuring equal distances in between the outer edges of the lace and the edges of the fabric. Pin in place and attach the lace by sewing a straight stitch along the top and bottom edges of the lace -- use the same thread in the needle that you used to embroider the lace. 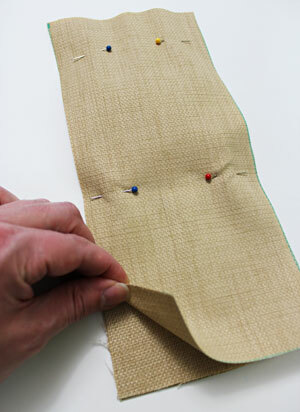 To create the back pieces of the pocket, cut two pieces of fabric to 5" wide by 11" high. Lay one of the back pieces flat with the right side facing up. Align the front pocket piece (the piece with the lace) on top of one of the back pieces, right side facing up, with the bottom edge of the front piece aligned with the bottom edge of the back piece. Pin in place. Align the remaining back piece on top of its matching piece, right sides together (wrong side facing up). Pin in place and sew a 1/4" seam along the side and bottom edges only -- leave the top edge open for turning. 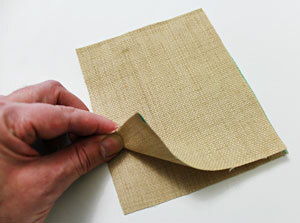 Trim the bottom corners up to the seam, turn the pocket right side out, and push out the corners. 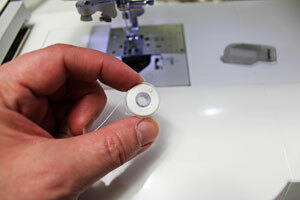 Turn the fabric of the opening in 1/4" and press; also press the side and bottom seams. Pin the fabric at the opening and top stitch a 1/8" seam along the top edge only. Add the remaining lace piece at the top edge of the fabric, position it and sew it in place just as you did earlier. Top stitch a 1/8" seam along the side and bottom edges of the entire piece. You're done! 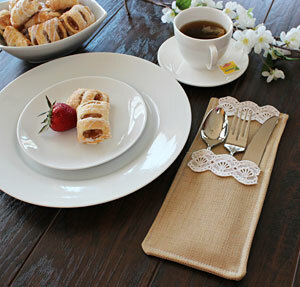 Add extra flair to your dining table with this elegant silverware pocket!